Some of Europe's most famous tennis courts are currently covered in snow, from Roland Garros to Wimbledon to Monte Carlo. It's March. It's not supposed to be like this: It's freezing out, the snow is falling and unless you've got access to a cosy indoor court, there's not much chance you'll be playing again until this cold snap melts away. So what can you do in the meantime? How can you improve your tennis and develop your game while the weather is bad? Here are a few drills and ideas for when it's too cold or wet out. it's a simple drill, but often those are the ones that provide the foundation to help you reach the next level. We'ret talking about wall volleys. Keep your racket head up and return it to the ready position after each volley. And see if you can keep going for minutes at a time without losing control of the ball. Not only does this kind of drill improve your reaction times. It also helps your practice keeping the wrist stiff and firm as you hit each volley. This simple drill is great to do on your own or with a partner. Volley to each other or take in in turns seeing how long you can go against the wall for. Shadowing is something that all players do. It's a timeless exercise for a reason. It's a simple way to practice your technique without using a ball. The best way to do it is to stand in front of a mirror with your racket. Go through your repertoire of shots, footwork and all. With the help of the mirror, you can see if you are performing each shot correctly. Keep an eye out for the stance you take for each shot, the extension of the arm on contact, the wrist movement to create the topspin, the follow through, and the weight transferring forwards with the back hip moving forward. Your back leg should come forwards after the contact and land in front of you. Then use that foot to push off to the recovery position. Of course, this is all done without the ball, so it take s a bit of imagination! Try repeating it 50 times or so. When any shot is performed this amount of times - even without the ball - all of those tiny technical details make their way into your muscle memory. The result? When it comes down to it in a real match, your technique won't let you down. Even the professional players struggle with their ball toss sometimes, even though it's vital to making sure your serve is on point and consistent. Having confidence in your toss will mean that even under pressure or in windy conditions, you're less affected than your opponent. Luckily, this is something you can practice indoors even when the weather is bad outside. Start by putting the racket down in front of your front foot. Then, go to play the serve but instead of hitting the ball let it bounce. All you have to do is try and get the ball to bounce on the racket. We have to get the ball to land on the racket 20 times. Over time this drill will help you get the ball toss in the right place more regularly. The final thing you can do is just watch some tennis. Some of the best matches of all time are readily available on Youtube. Going through some classic highlights is a great way to find inspiration and better understand the tactical side of the game. The Wimbledon final of 2008 between Roger Federer and Rafa Nadal is just one example. Alternatively, Indian Wells and the Miami Open are to come later this month, so try and catch some of the action! All of that should keep you busy until the sun starts shining again! Plenty of people get into tennis around the summer time. Wimbledon is on the telly, Andy Murray is most likely winning and Pimms is in the air. Tennis is the national sport for a fortnight. But the problem with only playing for that two-week period every year is that it's hard to improve. If you really want to step up your game you need to play regularly. It needs to be competitive, too. First of all, it's important to realise that tennis is as much a mental game as it is a physical one. If you watch the professionals, it's all about decision making, playing the right shots and executing them under pressure consistently. That kind of environment is difficult to recreate in training sessions. When you're training, there's nothing on the line, nobody on the other side of the net trying to prove themselves and generally, the atmosphere is relaxed, not competitive. Above we mentioned how it's impossible to recreate the pressure of a competitive match in a training session. That's because there's no anxiety associated with your shots. There are no nerves at play. Often this means that in training you'll hit better shots more consistently than when it really matters. There's also the cumulative effect of missing balls and shots you know are makeable. Frustration and other emotions can come into play. The more competitive game time you get, the better you become at dealing with hiccups, handling pressure and nerves and coming out on top when it really matters. Being able to perform consistently during competitive matches doesn't happen by accident. Another aspect of competitive tennis is the tactical side of things. Learning how to win during a match and adapting your strategy as a game unfolds are things you can't work on in training. When something isn't working, you need to learn to try a new tactic. If something is working, you need to be able to capitalise on that and punish your opponent's weaknesses. These situations don't occur during casual rallying, you have to learn them as you go. One of the most obvious benefits of playing competitive matches is that they give you the chance to win. Competing, giving your all and coming out on top is a great feeling. Who wouldn't want it?! Sometimes it's good to play FOR something, not just for the sake of it. Whether that's pride, financial reward of career progression, playing in a competitive environment is the best way to achieve those things. It's also the best way to chart your progress. If you never test yourself in competitive games, how do you know if your tennis is really improving? Obviously training is still important and a vital part of becoming a better tennis player. Improving your skills when the pressure is off is important, too. But the best thing to do is treat your training sessions like matches. Take them seriously and strive to improve. Otherwise your attitude in training will carry into competitive games and you'll get off to a slow start! Tempted to dust off your racket? I run a range of tennis classes for all ages and abilities, and also offer one-to-one of group coaching sessions in the Kingston and Surrey area. For more information, check out the services page. Otherwise, contact me today to sort out your first tennis lesson! 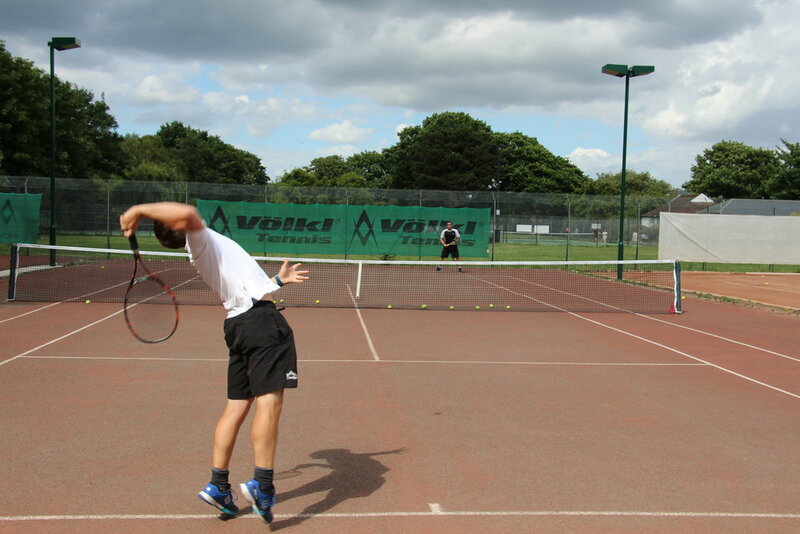 At Top4Tennis we specialise in school tennis sessions. That means going into schools and offering high-quality tennis coaching to kids in the mornings or afternoons. At the moment we run Top4Tennis school sessions at Hinchley Wood Primary School, Auriol Junior School, Mead Infant School, Christ Church Junior School, Christ Church Infant School and Hollymount Primary School. And we're always looking to expand. There are plenty of tennis coaches out there and different ways of going about a school coaching lesson. The difference between us and any other tennis company is the quality: We pay attention to really improving every child that attends the club. Our motto is that if children improve their tennis, they have more fun. That’s why we prioritise skills and technique, not just match play. During the first few weeks, we usually concentrate on basic technique, forehands and backhands and taking the racket back low with a straight arm. Little things, like making sure the child swings and finishes with the racket over the shoulder, make all the difference in the long run. These introductory sessions are when we try and iron out basic technique and flaws that would otherwise stick with a tennis player for life. These include important foundational skills like swinging with a straight arm and getting in the ready position before and after each shot. Two of the most attacking shots in tennis are the volley and the smash. In our school sessions we look closely at these. The main technique is all about creating a ‘V’ between our shoulder, the elbow and the racket for the volley on both forehand and backhand side. We should be able to see the back of the racket. If we can’t then it becomes a swing and we have no control over the ball and are likely to miss the ball. As we make contact with the ball we step forwards with the opposite foot and punch, keeping the wrist stiff. The foot you step forward on depends on the shot: left foot for the forehand volley and right foot for the backhand volley (if you are right-handed). Sometimes use the terminology high five the ball with the racket to help the child understand what they must do on the volley, but we must be careful they don’t sacrifice their technique where the shrink their elbow to create and L shape as if they are waving hello. Again we start the child in the ready position before and after each volley. On the smash it’s more simple. We start with the racket behind the head and the left hand above the head pointing to the ball, looking up the arm and looking at the ladybird on the side of your finger. To make contact with the ball we reach up to it the ball without letting it ball drop. On contact we then snap the wrist. After the technique side is completed, we play fun games at the end of each session. The idea here, with these different drills, is to give each child an opportunity to introduce the skills that have been learned. Once the children start to improve their technique we are ready to think more deeply about the dynamics of the ball. Most children naturally run to the bounce of the ball. So we start off with a simple game. Without the racket, the child must let the ball bounce and then drop below the waste before they catch it. This helps kids move behind the ball while letting the ball fall low enough to create a good shot. The number one rule is to not let the ball behind you but letting the ball fall in front of you. Next we try the exact same but with a racket. The next phase is to follow the same steps during a rally. The bouncing and dropping rule really helps the children ensure they have time before they hit the ball, which allows them to control their shots and complete a rally. The next step is learning to serve. We first start by focussing on the main foot. Whether left or right footed, this foot should be pointing towards the net post. The other foot is shoulder width apart behind but square on. That’s when the serve starts. With the racket behind the head like a smash, we practice tossing the ball above the head with the weaker hand. We like to pretend that there’s a clock above our head and that the toss needs to go up at 1 o’clock. We then reach up to hit the ball. It’s a very basic technique, but a fundamental part of the game. At the end of each session we try to put everything together. The kids play small matches, hone their new skills and really enjoy the game of tennis. If you’re interested in getting your children involved in tennis sessions at any of the following schools: Hinchley Wood Primary School, Auriol Junior School, Mead Infant School, Christ Church Junior School, Christ Church Infant School and Hollymount Primary School - just get in touch today and we'll get the ball rolling. Or maybe you've got kids at a primary or secondary school that would be interested in having regular coaching sessions? We're always on the look out for new opportunities.